Object-prototype space-symbol , made ​​by hand or with unusual ways to emphasize the contradictions and paradoxes of luxury and poverty . Small absurd monuments to the dissolution of the types . 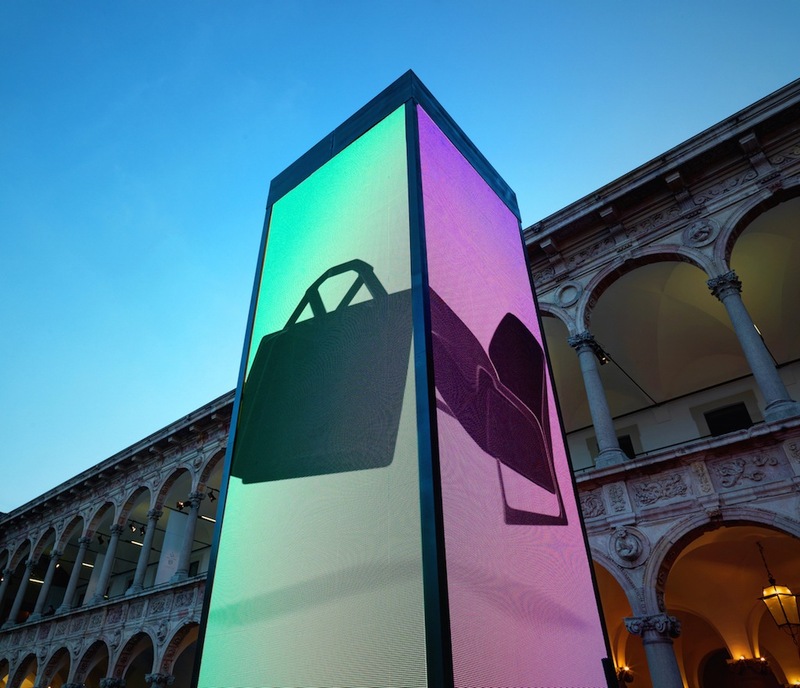 A square luminous tower in the Main Courtyard of the University of Milan was a landmark and connection be- tween the exhibition-event of Interni and Audi City Lab, the temporary lab- oratory for exhibitions and encoun- ters set up by the Ingolstadt-based automaker at Via Monte Napoleone 27c. The space on three floors, with windows on Milan’s main street of luxury, was the center of a full-range investigation on the relationship be- tween design and disciplines of the future, conducted through a series of conversations organized by the Interni among leading players in the worlds of design, culture and creativity (reports on the individual events are on the following pages). 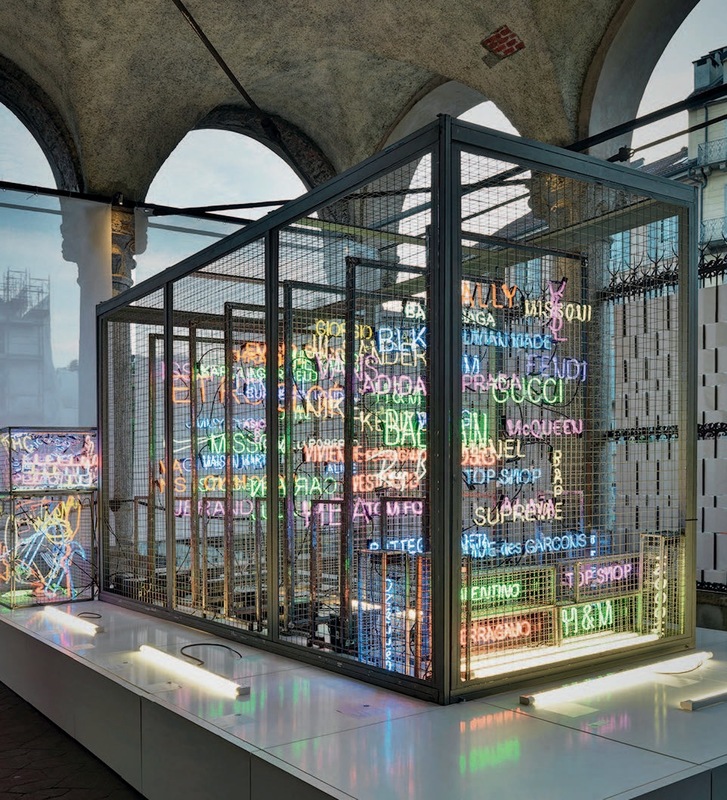 In this setting, contributions on creative and productive strategies for the fu- ture were made by Walter Maria de Silva, Felice Limosani, Moritz Waldemeyer, Mario Cucinella, Stefano Giovannoni, Jacopo Foggini and Romeo Gigli, among others. 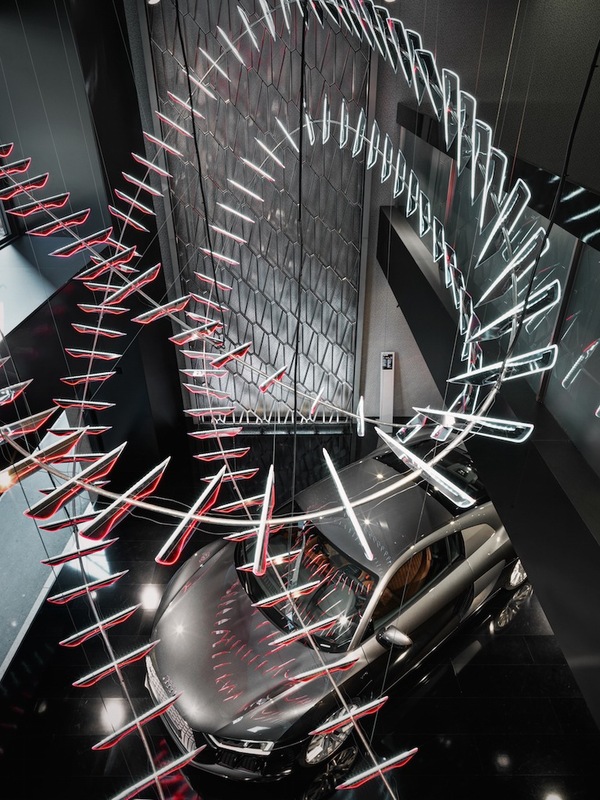 The spaces of Audi City Lab host- ed the new R8 V10 super sports car, presented at the last Geneva Motor Show, as well as Ducati and Lamborghini models; also on display were the most successful products by Giugiaro Design, like Sabrina chair of Okamura, and by the Audi de- sign team, like the Audi Sport Racing Bike and the Audi Carbon Skis. Concept and directing of the video installation of Studio Azzurro by Fabio Cirifino, photography by Fabio Cirifino with Giuseppe Baresi and Riccardo Apuzzo. Video editing by Monica De Benedictis with Elisa Bianchi (assistant); sounds and music by Tommaso Leddi, general production by Carmen Leopardi. 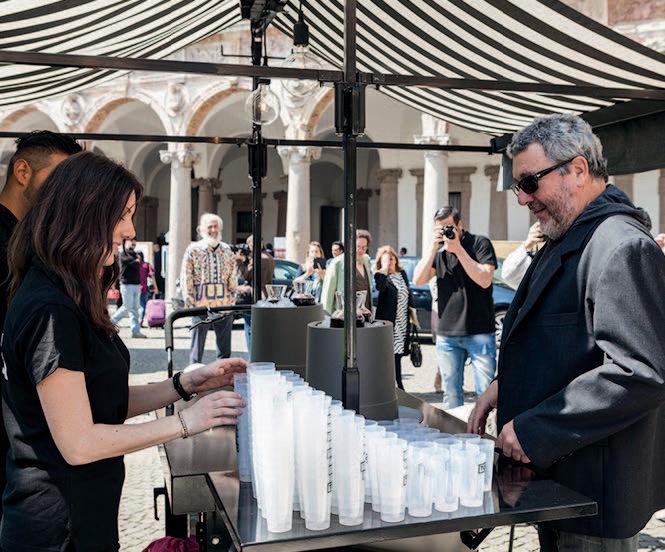 Sharing and service: these are the values behind the performance done by Philippe Starck in the Cortile d’Onore of the University, at the opening of En- ergy for Creativity. 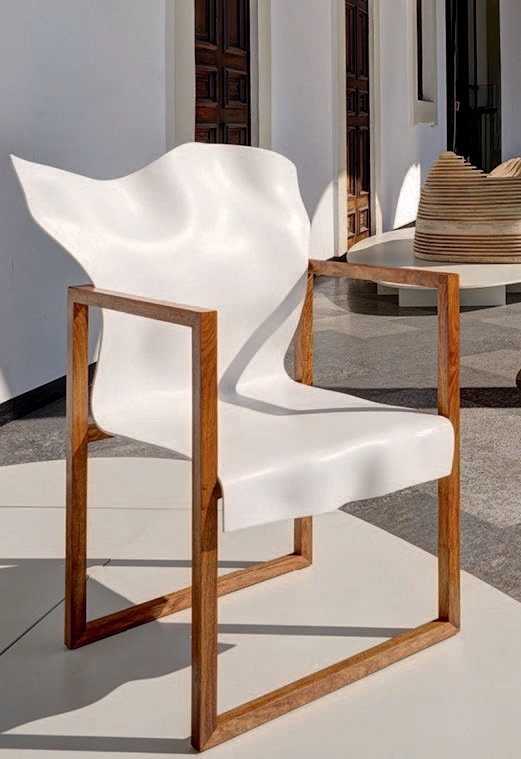 The designer, in collaboration with the Brazilian furniture brand Tog, offered – from a triporteur of his design – a non-alcoholic beverage to quench thirst in a healthy way. A cheerful, provocative performance to send a message about the role of the designer and the mission of serving people, offer- ing effective responses to their needs. 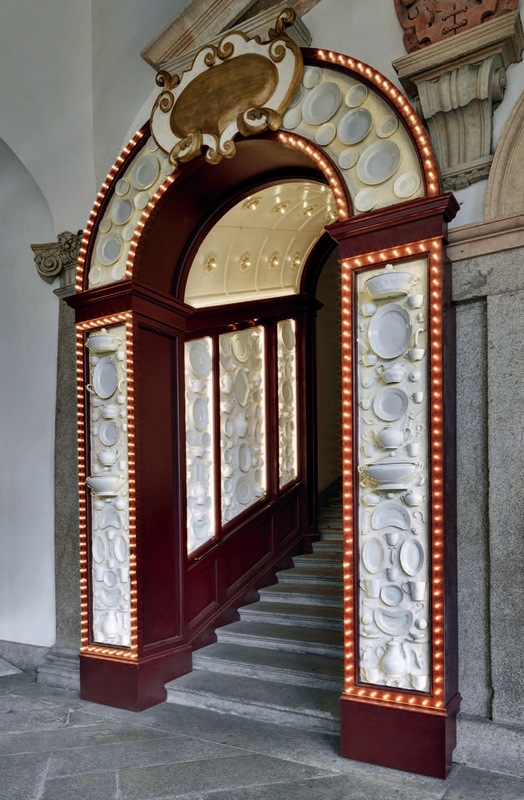 Alessandro Michele, creative director of Richard Ginori – and since 2015 also of Gucci – created the installation Folklore made by Richard Ginori for the Portals of the Scaloni d’Onore. The historic Florentine porcelain producer, which began its story in 1735 at the Manifattura di Doccia, is one of the most prestigious Italian manufacturers of tableware. 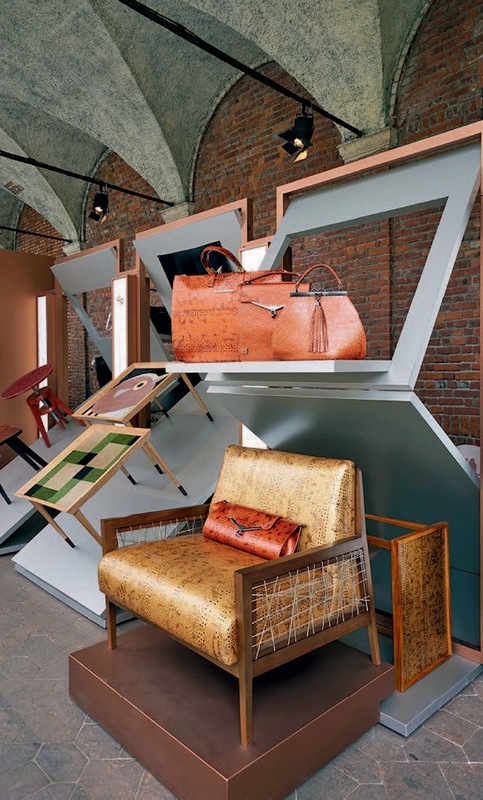 Acquired by Gucci in 2013, the firm has its production facilities in Sesto Fiorentino. Object-prototype space-symbol , made ​​by hand or with unusual ways to emphasize the contradictions and paradoxes of luxury and poverty . Small absurd monuments to the dissolution of the types . 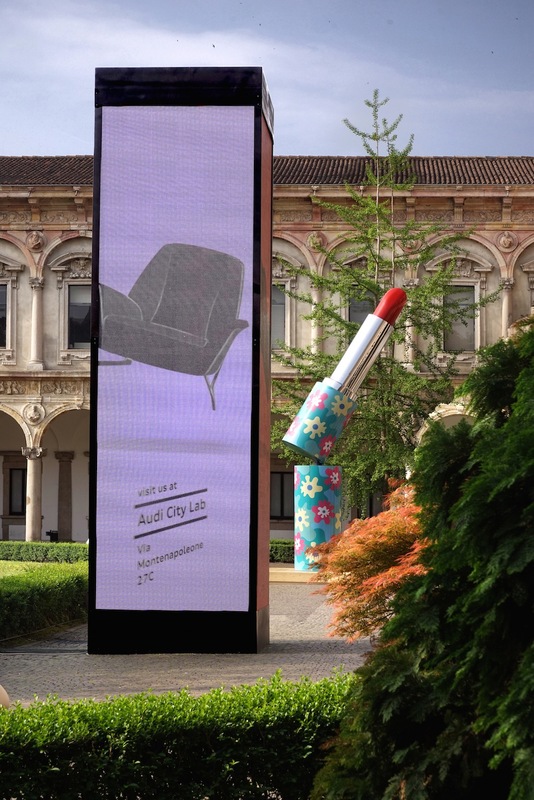 Audi City Lab A square luminous tower in the Main Courtyard of the University of Milan was a landmark and connection be- tween the exhibition-event of Interni and Audi City Lab, the temporary lab- oratory for exhibitions and encoun- ters set up by the Ingolstadt-based automaker at Via Monte Napoleone 27c. 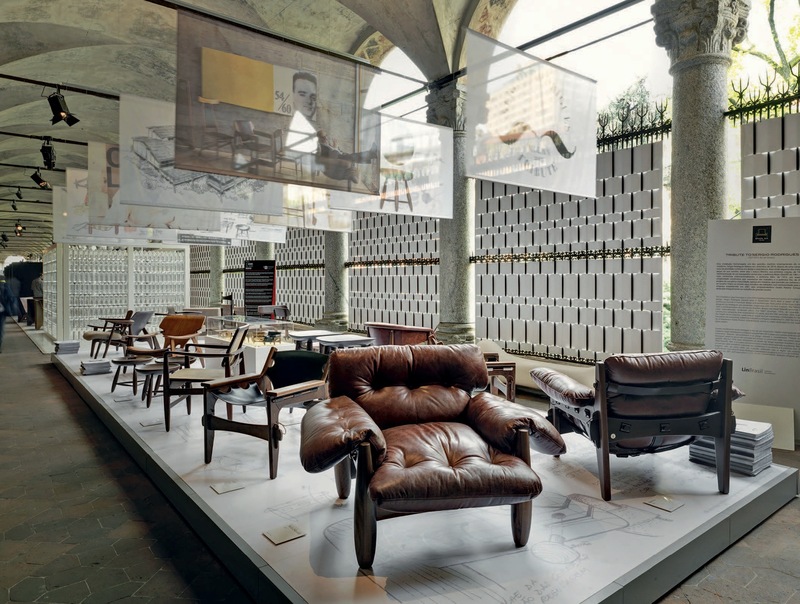 The space on three floors, with windows on Milan’s main street of luxury, was the center of a full-range investigation on the relationship be- tween design and disciplines of the future, conducted through a series of conversations organized by the Interni among leading players in the worlds of design, culture and creativity (reports on the individual events are on the following pages). 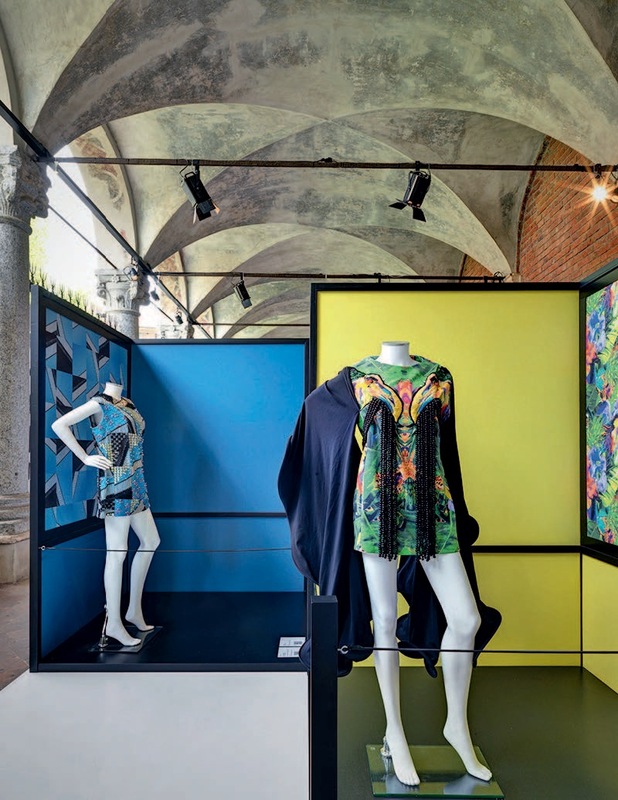 In this setting, contributions on creative and productive strategies for the fu- ture were made by Walter Maria de Silva, Felice Limosani, Moritz Waldemeyer, Mario Cucinella, Stefano Giovannoni, Jacopo Foggini and Romeo Gigli, among others. 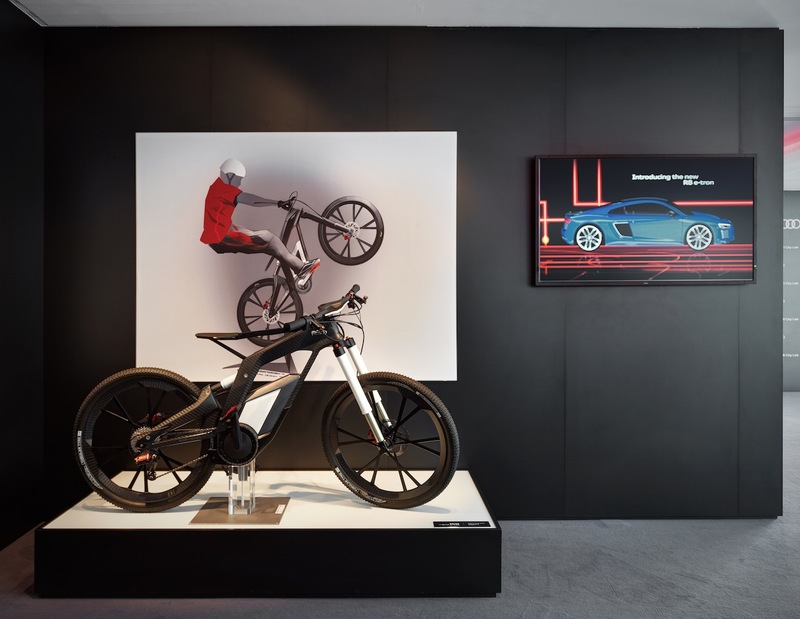 The spaces of Audi City Lab host- ed the new R8 V10 super sports car, presented at the last Geneva Motor Show, as well as Ducati and Lamborghini models; also on display were the most successful products by Giugiaro Design, like Sabrina chair of Okamura, and by the Audi de- sign team, like the Audi Sport Racing Bike and the Audi Carbon Skis. 10 Metropolitan Tastes in the World Video installation by STUDIO AZZURRO Concept and directing of the video installation of Studio Azzurro by Fabio Cirifino, photography by Fabio Cirifino with Giuseppe Baresi and Riccardo Apuzzo. Video editing by Monica De Benedictis with Elisa Bianchi (assistant); sounds and music by Tommaso Leddi, general production by Carmen Leopardi. 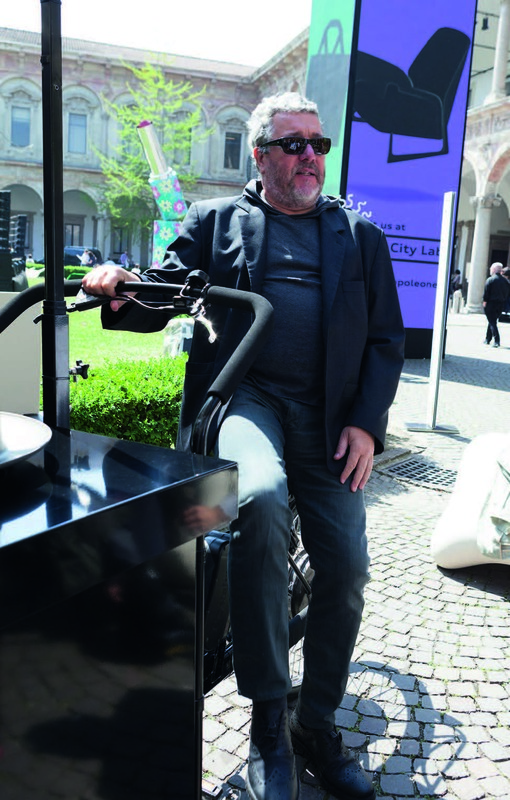 We love We care Performance by PHILIPPE STARCK with TOG Sharing and service: these are the values behind the performance done by Philippe Starck in the Cortile d’Onore of the University, at the opening of En- ergy for Creativity. 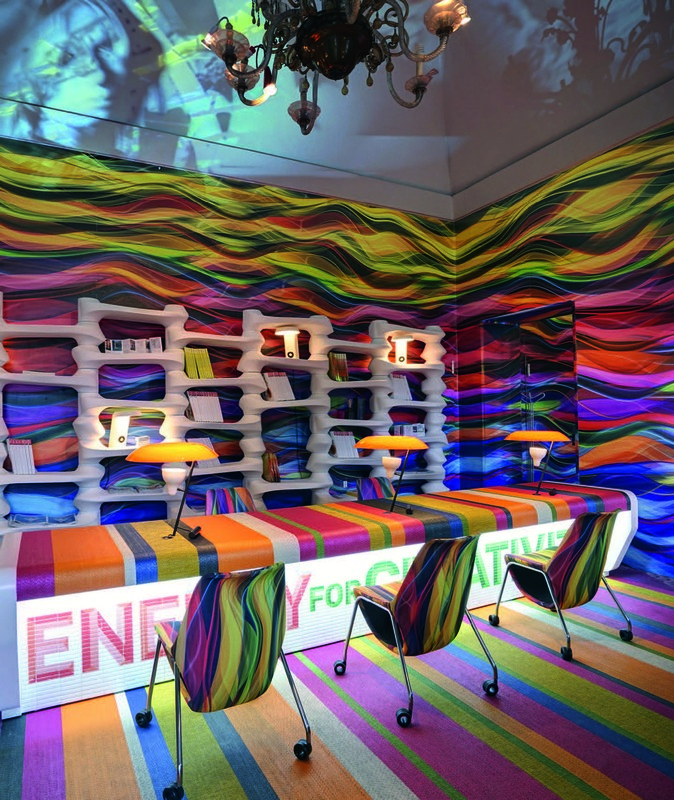 The designer, in collaboration with the Brazilian furniture brand Tog, offered – from a triporteur of his design – a non-alcoholic beverage to quench thirst in a healthy way. A cheerful, provocative performance to send a message about the role of the designer and the mission of serving people, offer- ing effective responses to their needs. 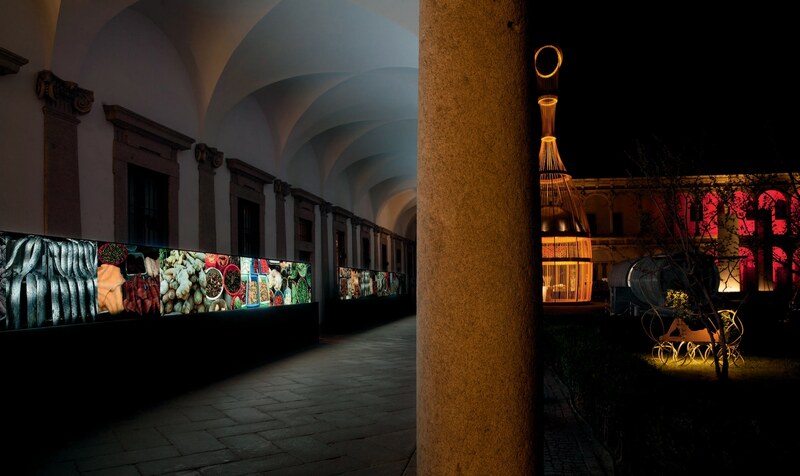 Folklore Project by ALESSANDRO MICHELE with RICHARD GINORI Alessandro Michele, creative director of Richard Ginori – and since 2015 also of Gucci – created the installation Folklore made by Richard Ginori for the Portals of the Scaloni d’Onore. 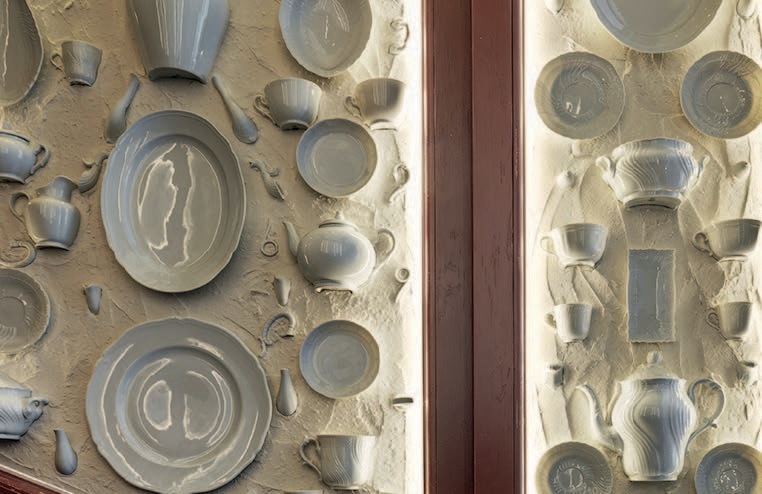 The historic Florentine porcelain producer, which began its story in 1735 at the Manifattura di Doccia, is one of the most prestigious Italian manufacturers of tableware. 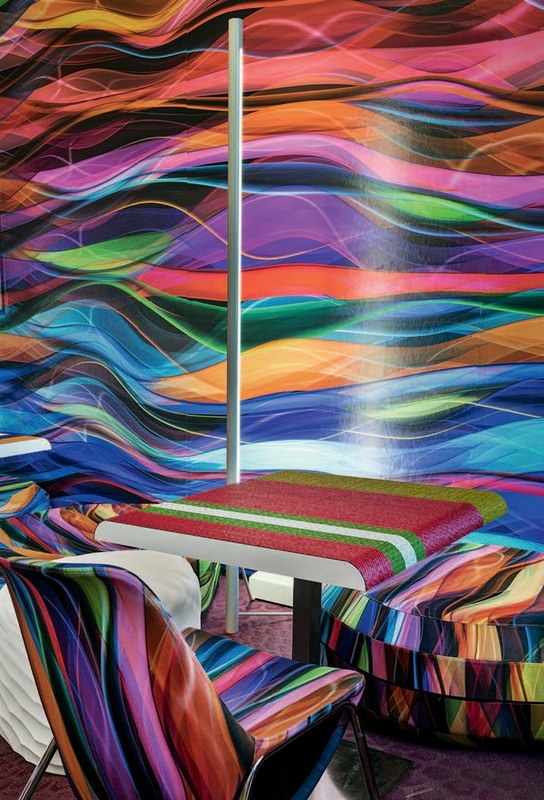 Acquired by Gucci in 2013, the firm has its production facilities in Sesto Fiorentino. 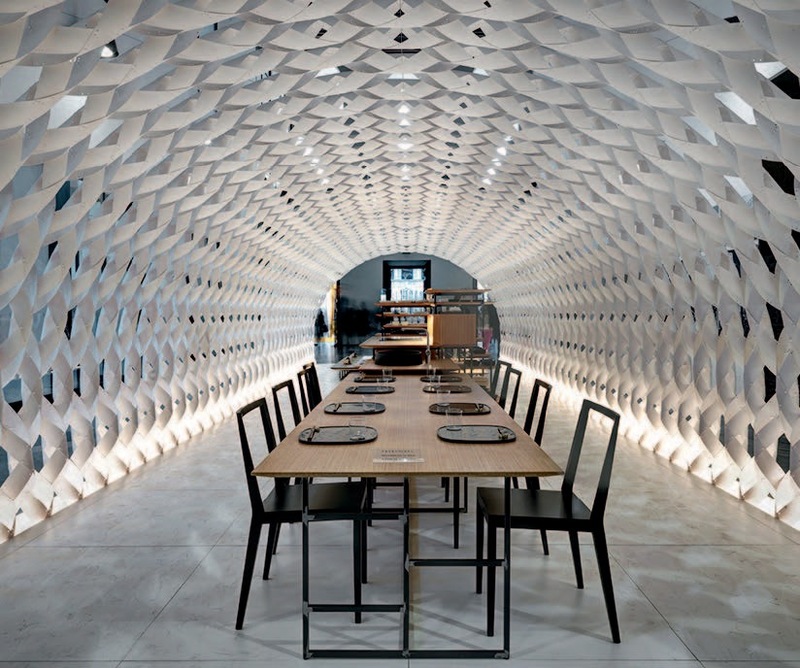 Irori Project by KENGO KUMA & ASSOCIATES for TJM DESIGN – KITCHENHOUSE In the Hall of the auditorium a pavilion was set up made with woven strips of vulcanized paper, containing the Irori kitchen, composed of bamboo boards sup- ported by a steel structure. This particular composition allows the kitchen to expand or to shrink. The studio Kengo Kuma & Associates created the project in collaboration with the Japanese company TJM Design, which produces high- profile kitchens under the brand Kitchenhouse. Lights by Viabizzuno. 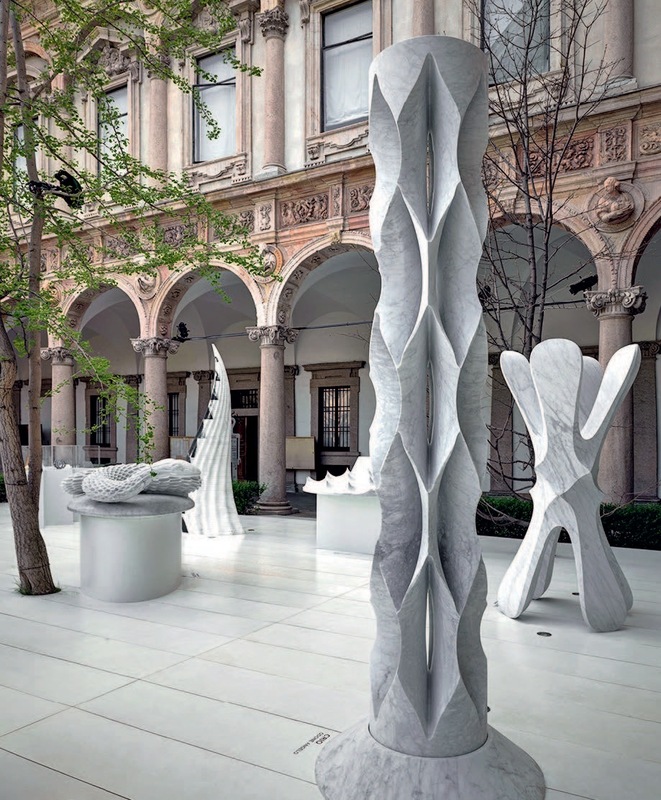 Digital Lithic Design Project by RAFFAELLO GALIOTTO with MARMOMACC and Antolini, Budri, Decormarmi, Intermac, Lithos Design, Odone Angelo, Omag The installation Digital Lithic Design in the Cortile d’Onore was a project by Raffaello Galiotto with Marmomacc, the International Exhibition of Stone Design and Technology, now at its 50th edition this year (in Verona from 30 September to 3 October). 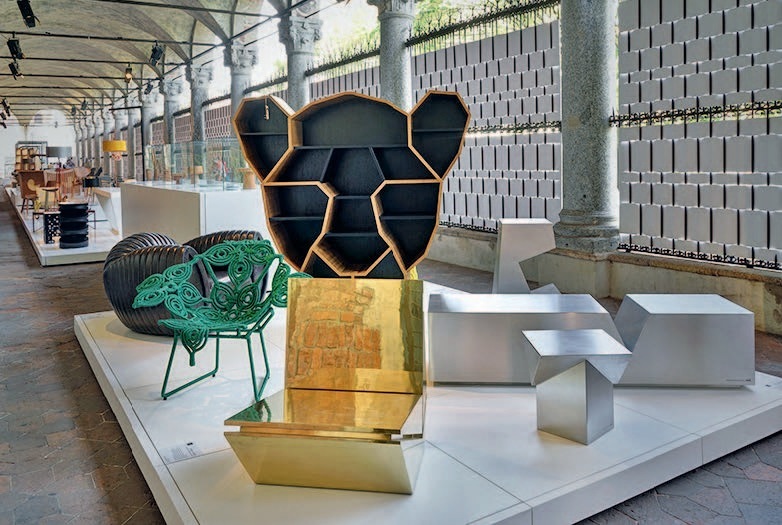 It contained seven works: Litocorno with Antolini; the series Cat- enata, Corallo, Corona, Madrepora, Porifera, Serpentina with Budri; Quadrilobo with Decormarmi; Bicefalo with Intermac; Retina with Lithos Design; Carapace with Omag; Crio with Odone Angelo. Designing China Mood-Object Curator JANG DONGJIANG with GUANGDONG HUASONG FURNITURE GROUP The J-Union seats in wood, designed by Jiang Feng; the Fly Series chair in Asian rosewood and acrylic solid surface by Yang Dongjiang; Tea Table in wood and glass by Zhu Pei; Catable 2.0, a table that is also a play space for cats, in mahogany, by Ruan Hao. 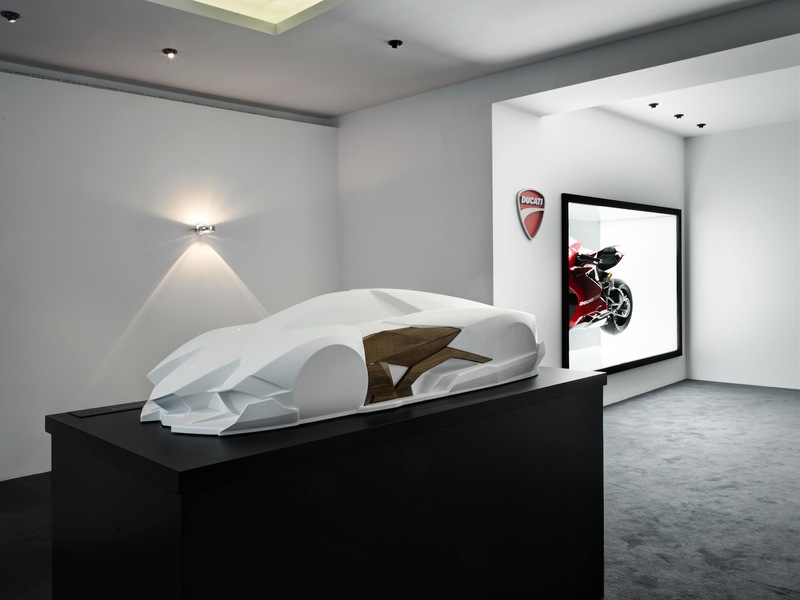 The exhibition was produced in collaboration with Guangdong Huasong Furniture Group. Energia Brasileira Project by BRAZIL S/A Coordination JOSÉ ROBERTO MOREIRA DO VALLE, ANGELO DERENZE, FRAN ABREU The group show Energia Brasileira of Bra- zil S/A, held in the Portico del Richini and Portico San Nazaro, was composed of a series of exhibitions, including the Tribute to Sergio Rodriguez curated by LinBrasil, 100% Brazil on the crafts culture of the country, The Neon Traffic Dealer, a show on the neon artist Alê Jordão, Sou do Mundo, Sou Minas Gerais, on design and fashion from the Brazilian state of Mina Gerais. 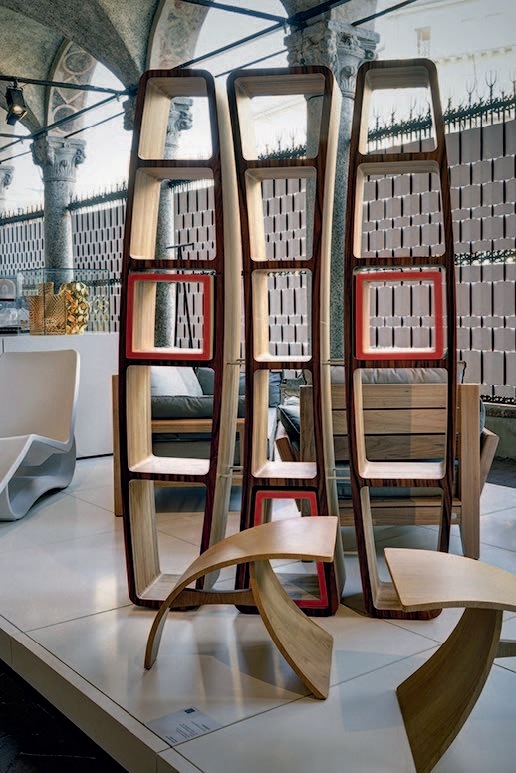 The itinerary of exhibitions also included with Design na Pele Escritas; Best in Show- Ceramics of Brazil; Lux Brasil - Lighting Products; Neobox: Made to Mea- sure; Rugs of Brazil; Ideiafactory: Tailor-made in Italy for Brazil. Press Office Waves of Creativity Project by MAC STOPA with BOLON The Press Office was organized based on a design by the Polish architect and designer Mac Stopa, founder of Massive Design, in collaboration with Bolon, the Swedish company that produces innovative floors and creative furnishings. With the participation of Tonon, Profim, TMK Project and Saint-Gobain For- mula, Marro, Advertis Group, Casali, Mosaico Digitale. 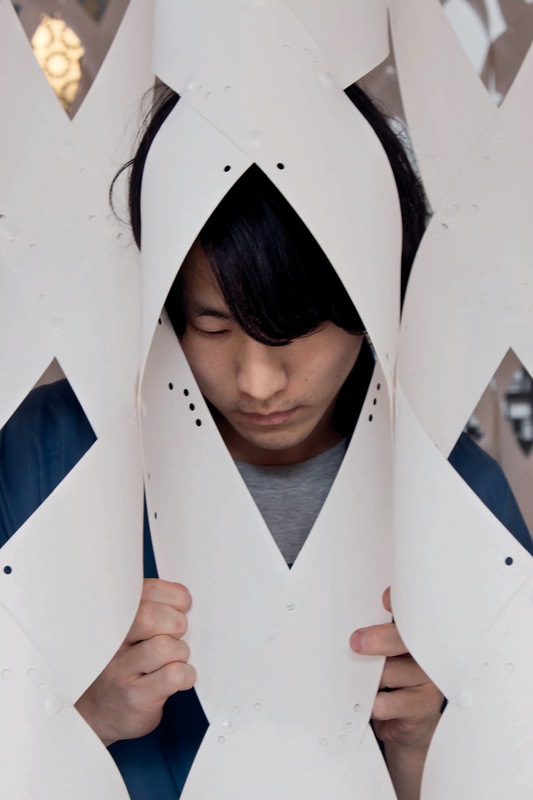 Technical sponsors: Flos, Samsung, The Fake Factory, Danese. The Copper Labyrinth Project by BART VAN HEESCH and EMILIE KRÖNER LOOK INTO MY EYES STUDIOS with THE EUROPEAN COPPER INSTITUTE The labyrinth, made in collaboration with the European Copper Institute, is composed of a tube of 100% recycled copper of almost 250 m, polished by hand and sand-blasted, then curved in waves. 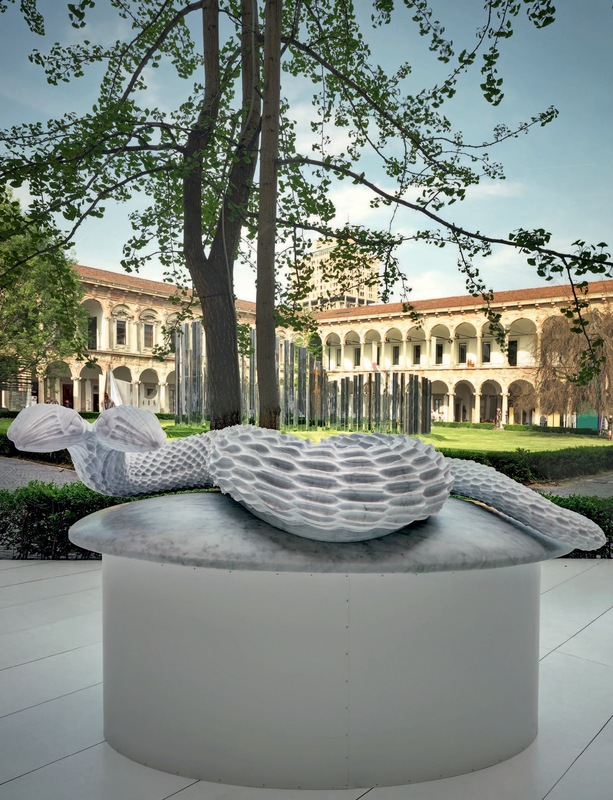 Placed in the Cortile dei Bagni, the labyrinth covered an area of 100 m2, tracing a concentric design on the ground: the installation will remain at the University until the end of Expo Milano 2015. The new I Limiti collection created by designer Valerio Cometti and composed of seats, lamps and vases. 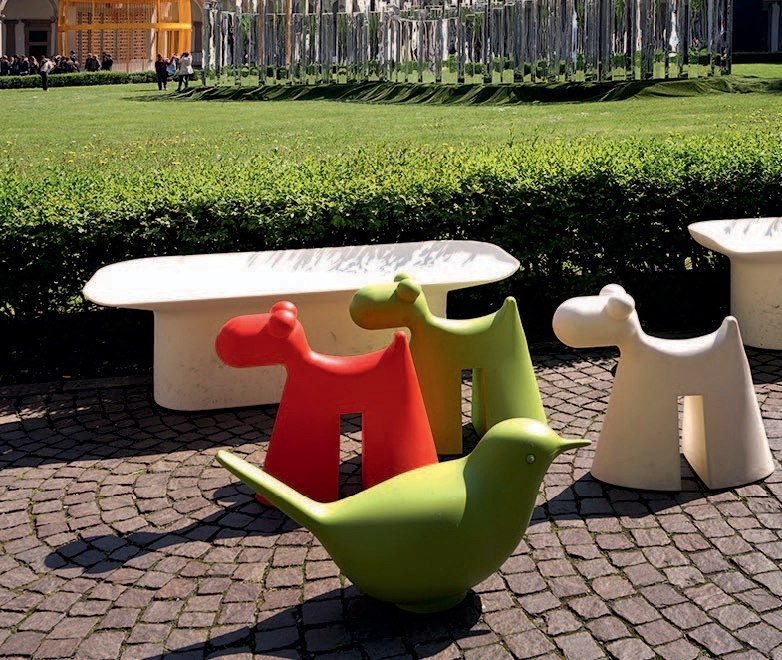 Doggy and Pulcino by Eero Aarnio, decorative polyethylene seats obtained through rotomolding. Italcementi Group presented the Minamo- ra outdoor benches by Benedetta Tagliabue and Makoto Fukuda of the studio EMBT Miralles Tagliabue, made with two layers of i.design Effix, the innovative high-performance mortar by Italcementi that combines the durability of a ce- ment-base material with the washability of a plastic material. 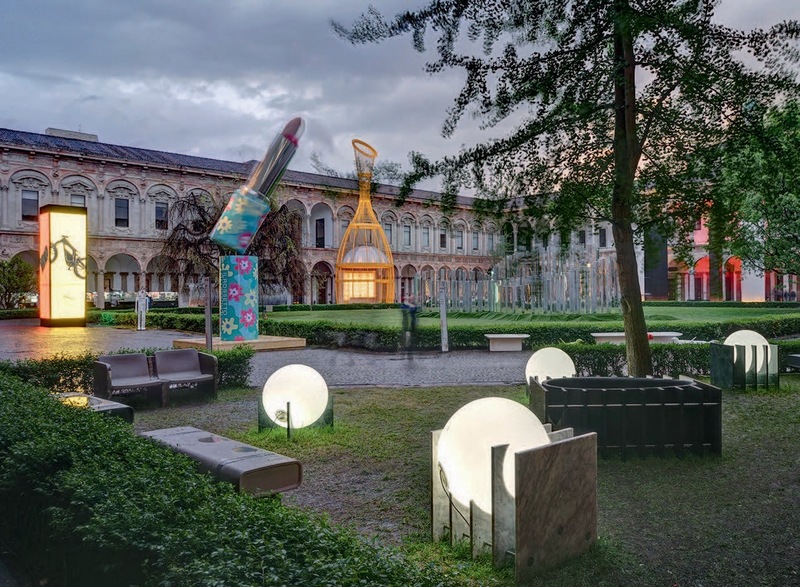 The Milanese artist Carla Milesi, in the green spaces of the Cortile d’Onore, showed Ricciolina, a cement bench in two colors with solar panels and LED lighting. 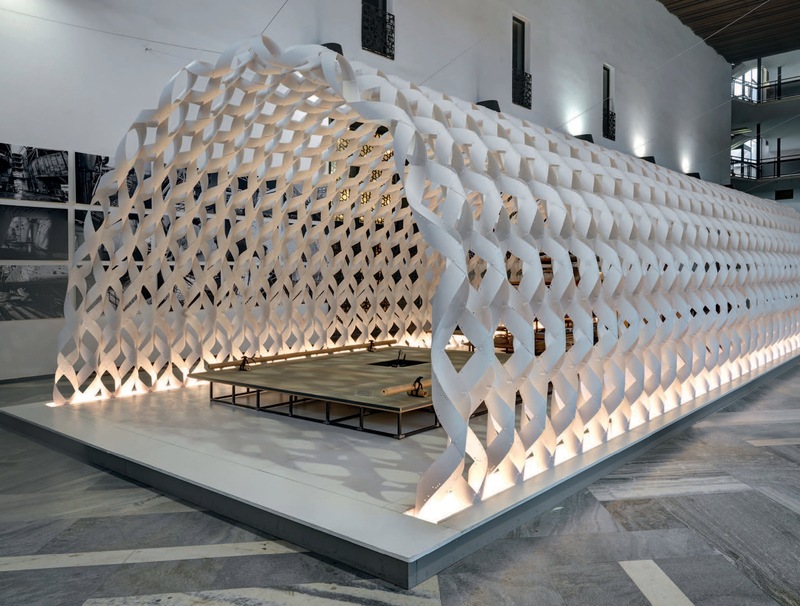 In the Hall of the auditorium a pavilion was set up made with woven strips of vulcanized paper, containing the Irori kitchen, composed of bamboo boards sup- ported by a steel structure. This particular composition allows the kitchen to expand or to shrink. 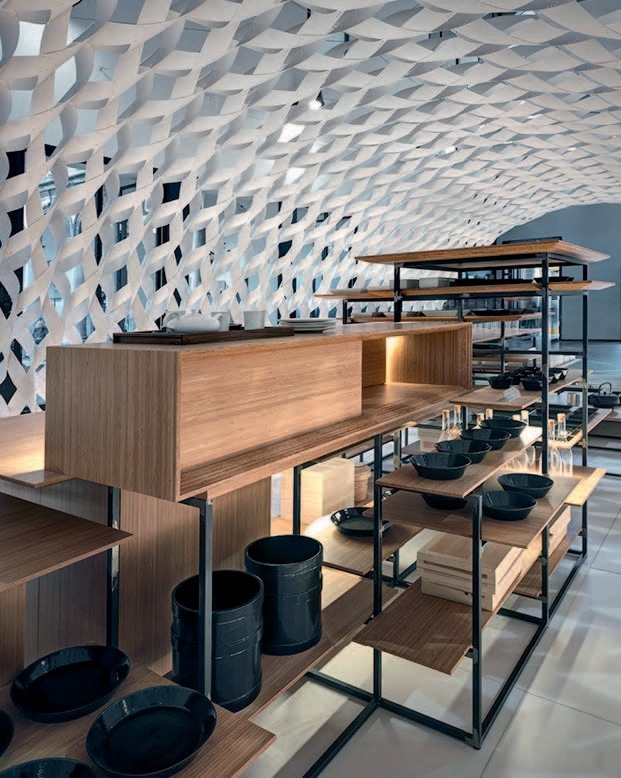 The studio Kengo Kuma & Associates created the project in collaboration with the Japanese company TJM Design, which produces high- profile kitchens under the brand Kitchenhouse. Lights by Viabizzuno. 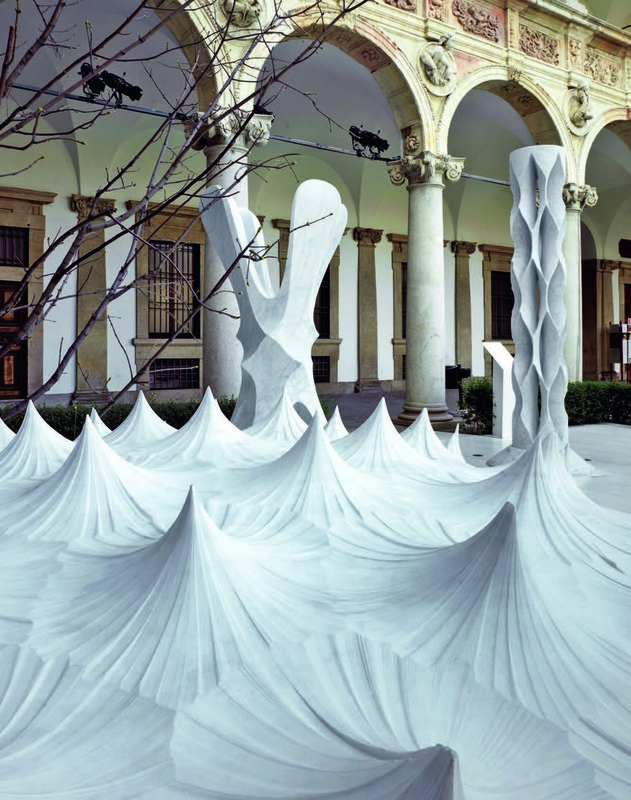 The installation Digital Lithic Design in the Cortile d’Onore was a project by Raffaello Galiotto with Marmomacc, the International Exhibition of Stone Design and Technology, now at its 50th edition this year (in Verona from 30 September to 3 October). 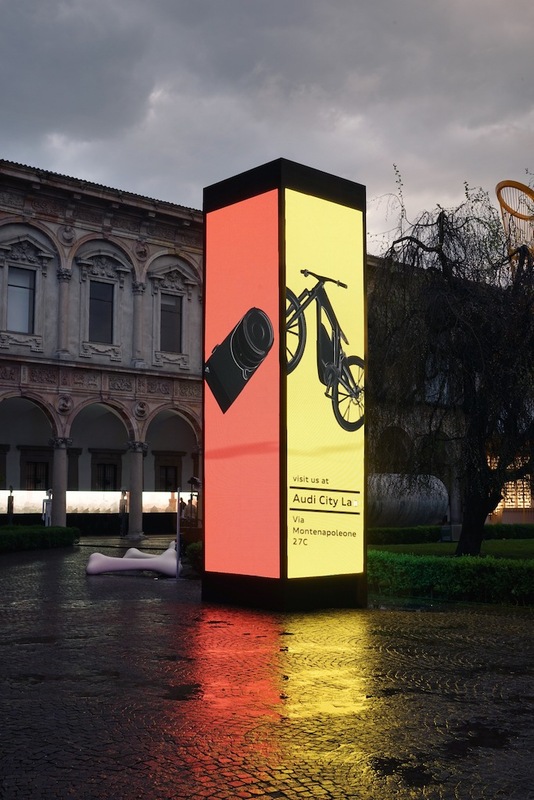 It contained seven works: Litocorno with Antolini; the series Cat- enata, Corallo, Corona, Madrepora, Porifera, Serpentina with Budri; Quadrilobo with Decormarmi; Bicefalo with Intermac; Retina with Lithos Design; Carapace with Omag; Crio with Odone Angelo. 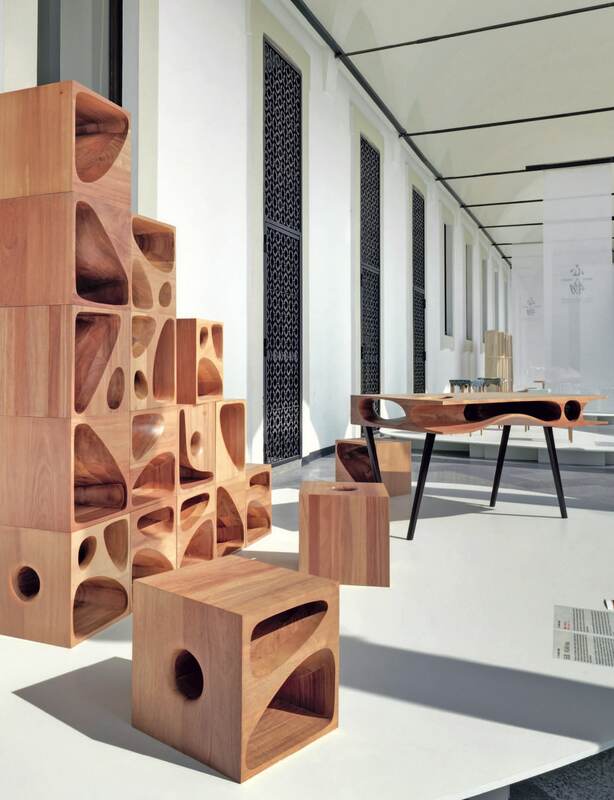 The J-Union seats in wood, designed by Jiang Feng; the Fly Series chair in Asian rosewood and acrylic solid surface by Yang Dongjiang; Tea Table in wood and glass by Zhu Pei; Catable 2.0, a table that is also a play space for cats, in mahogany, by Ruan Hao. 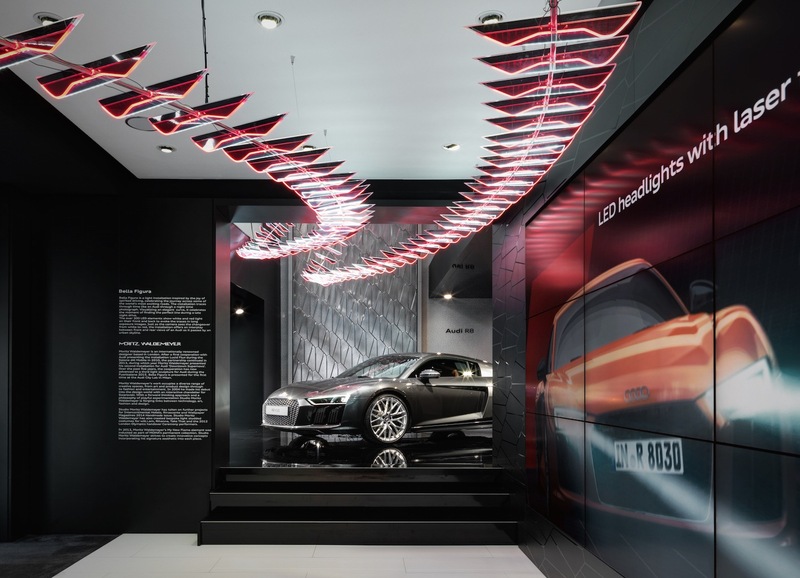 The exhibition was produced in collaboration with Guangdong Huasong Furniture Group. 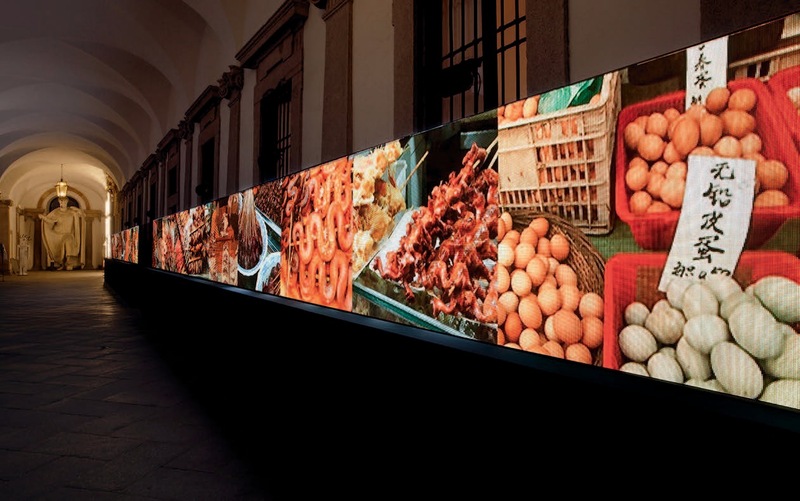 The group show Energia Brasileira of Bra- zil S/A, held in the Portico del Richini and Portico San Nazaro, was composed of a series of exhibitions, including the Tribute to Sergio Rodriguez curated by LinBrasil, 100% Brazil on the crafts culture of the country, The Neon Traffic Dealer, a show on the neon artist Alê Jordão, Sou do Mundo, Sou Minas Gerais, on design and fashion from the Brazilian state of Mina Gerais. 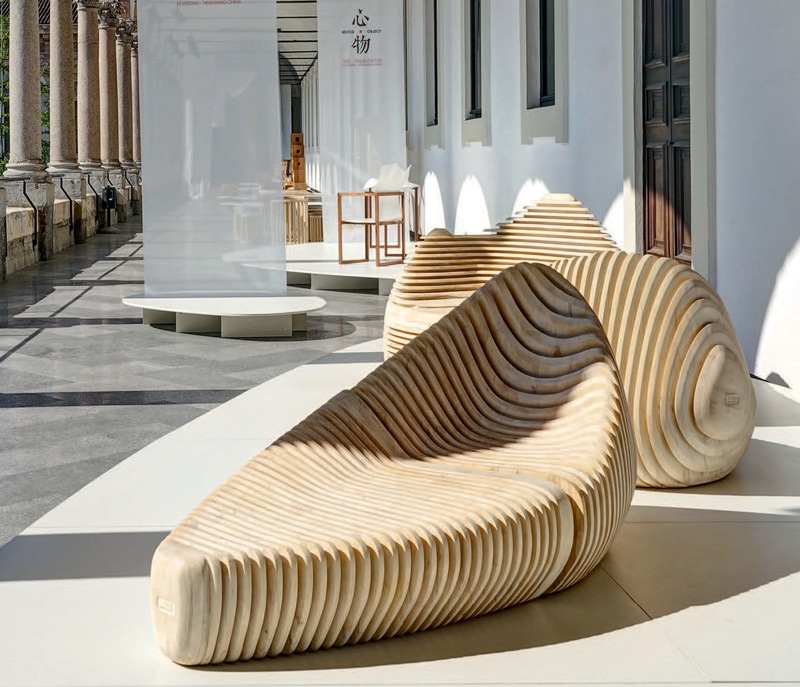 The itinerary of exhibitions also included with Design na Pele Escritas; Best in Show- Ceramics of Brazil; Lux Brasil – Lighting Products; Neobox: Made to Mea- sure; Rugs of Brazil; Ideiafactory: Tailor-made in Italy for Brazil. The Press Office was organized based on a design by the Polish architect and designer Mac Stopa, founder of Massive Design, in collaboration with Bolon, the Swedish company that produces innovative floors and creative furnishings. With the participation of Tonon, Profim, TMK Project and Saint-Gobain For- mula, Marro, Advertis Group, Casali, Mosaico Digitale. Technical sponsors: Flos, Samsung, The Fake Factory, Danese. The labyrinth, made in collaboration with the European Copper Institute, is composed of a tube of 100% recycled copper of almost 250 m, polished by hand and sand-blasted, then curved in waves. 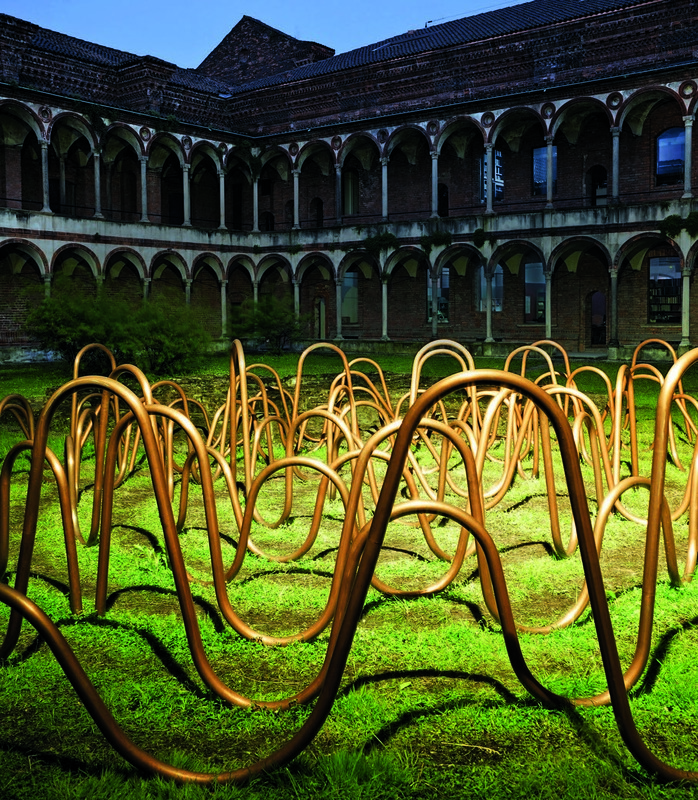 Placed in the Cortile dei Bagni, the labyrinth covered an area of 100 m2, tracing a concentric design on the ground: the installation will remain at the University until the end of Expo Milano 2015. 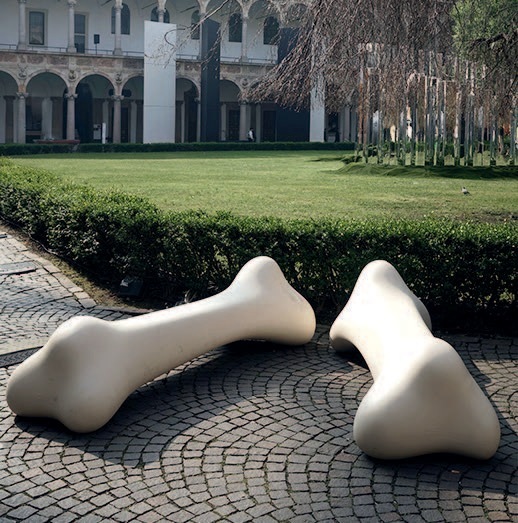 Tera, an Italian manufacturer that makes indoor-outdoor furnishings in polyethylene and marble or stone, set up a lounge area in the Cortile d’Onore with pieces from the new I Limiti collection created by designer Valerio Cometti and composed of seats, lamps and vases. Among the furnishings on display, the Fermat lamp, the Cauchy bench and the Turing armchair. 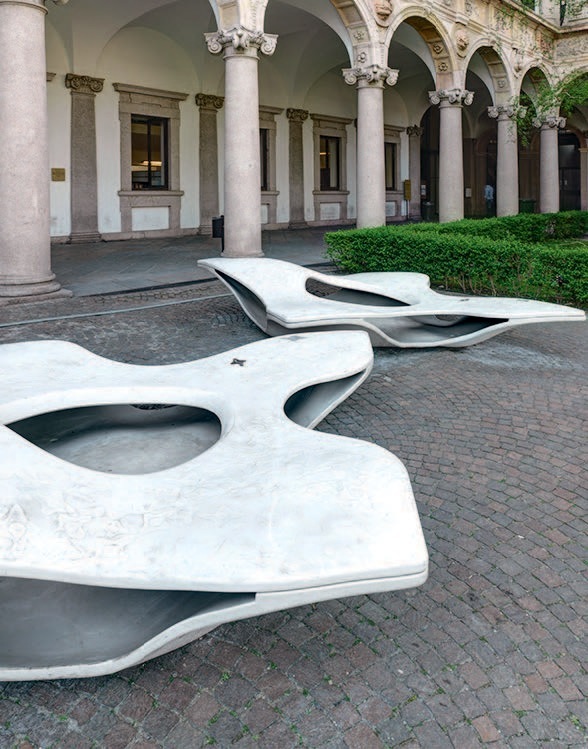 Serralunga organized small outdoor lounges with furnishings from its outdoor collection, including the new products Doggy and Pulcino by Eero Aarnio, decorative polyethylene seats obtained through rotomolding.